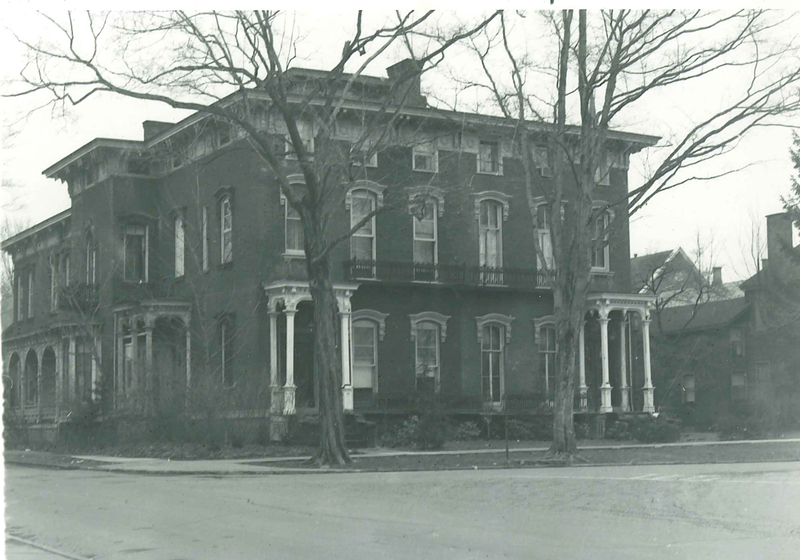 We are excited to announce the Crawford County Historical Society is now the proud owner of the James and Elizabeth Tarr Mansion on Meadville’s Diamond Park! Even though we have purchased the building, the work is far from completed with fundraising efforts stepping up to begin restoration projects. You will find a donation form in this issue to assist with these efforts. Any amount, regardless of how large or small, is a great help in saving this beautiful structure. Diamond Park was a gift from David Mead to the city of Meadville in 1795, and was used by residents in many different ways, including drill practice by the Pennsylvania militia led by Mead. It eventually became surrounded by churches, government buildings, businesses and residences, many of which are still standing today. With the newest structures (the exception being the new county Judicial Center currently under construction next door to the Tarr Mansion) dating to the early 1900s, the Diamond has retained much of its charm-or gained charm it didn’t have. 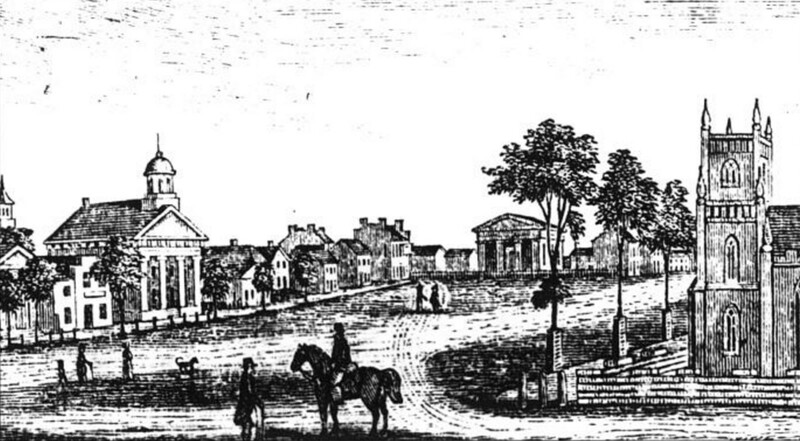 Around 1840 the Diamond became almost like the Sahara or great desert of Africa, with scarcely a vestige of green upon it…a drove of 900 mules on their way from Kentucky to New York whilst being driven across it all dropped and rolled in the dust, creating such a cloud that the buildings on one side could scarcely be seen from the other side. The following day another drove of 1,100 came with the same result…about the same date trees were planted at many places over it. Across each end, posts with one rail intervening, were place outside of the trees, leaving passage ways at each side as now, but the country people, thinking their rights were interfered with, pulled up the trees and posts. It thus remained until 1863, when I presented the fountain to the town which instigated the present improvements. That fountain is still there, restored in recent years, an in addition to it more trees, statues honoring various groups in our history, memorial boulders, a gazebo, and so much more. Diamond Park has undergone yet another renaissance in recent years with the Allegheny College Founder’s House, the former Junior High School and the former National Guard Armory being saved from decay or destruction and converted to glorious and useful space. We are glad as the Historical Society to take our place in the center of our county seat among friends and cannot thank you enough for your help getting us there! The 1866/67 mansion, actually a double house for both the Tarrs and Mrs. Tarr’s daughter from her first marriage, is an icon in Crawford County for many reasons. Not only is the building an attractive Italianate mansion that would have been a terrible loss on the landscape of historic Crawford County, but James Tarr can be credited as one of the nation’s first oil barons. It is amazing to think the Tarr Mansion was destined for a landfill but now will become once again one of the most impressive structures on Diamond Park. For those of you who are not aware, the park was not always quite as impressive as we see it today. 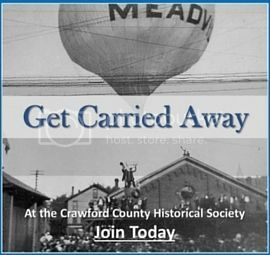 Joshua Sherretts is President of the Board of Directors at the Crawford County Historical Society and Executive Director at the Baldwin-Reynolds House Museum. 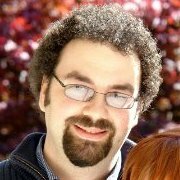 A lifelong resident of the area, Joshua is also the author of Around Saegertown and co-author of Oil Boom Architecture: Titusville, Pithole, and Petroleum Center. His other writings can be found in the Meadville Tribune, GoCrawfordCounty.com and Erie Times. In addition to his duties at the museum and historical society, Joshua is a involved with a number of community organizations dedicated to preserving and improving the local area. He is a graduate of Edinboro University of Pennsylvania where he earned degrees in History and Secondary Education. Joshua lives with his wife in Meadville.